TRAVEL INSURANCE IS COMPULSORY ON ALL TOURS. We recommend DAN Insurance for divers. Some dive areas are quite remote and help can be a long way off, particularly if those in charge are aware you are not insured. Aliwal Shoal – voted in the Top 10 world dive sites, Aliwal Shoal is located on the Kwazulu Natal on the East coast of Southern Africa, approx 50kms south of Durban. The shoal houses largely pelagic fish, minimal reefs and a few wrecks. Its main claim to fame is the sharks. Depending on season there are many species of resident sharks including Tigers, Grey Nurse (raggies) and Bullsharks. As a consequence local dive operators conduct regular shark dives, an eye opening experience for any diver. The reef is also known for large numbers of rays and seasonally Whale Sharks. Sodwana Bay – Located in the Greater St Lucia Water Park, Sodwana Bay is a reef based dive location. There are many spectacular reef dives and the seasonal “raggie” dive at 1/4 Mile Reef in Dec-Jan, a great intor to shark diving for those reluctant to give it a go. There is a large range of accommodation ranging from tents to 5-star chalets. Cape Town – Whilst well known for Great White Shark cage diving, the Cape Town area also has numerous dive wrecks including the Maori, the Astor, the Katzu Maru, the Smitswinkel Bay wrecks, the Pietermaritzburg, and the Clan Stuart. Rebreather divers are welcomed here. Cage diving is available in False Bay just outside Cape Town where the breaching sightings most often occur, or Gannsbaai further along the south coast. Cave Diving – Southern Africa boasts 2 major inland cave dives, Boesmansgat and Wondergat (Amazing Hole). Boesmangat is by arrangement only, takes about 10 days to set up and dive as the area is poorly accessible, several hours from either Johannesburg or Cape Town. Divers are required to demonstrate adequate competency prior to going here. Wondergat is a disused asbestos mine in the North-West Province, and again is for experienced divers only. 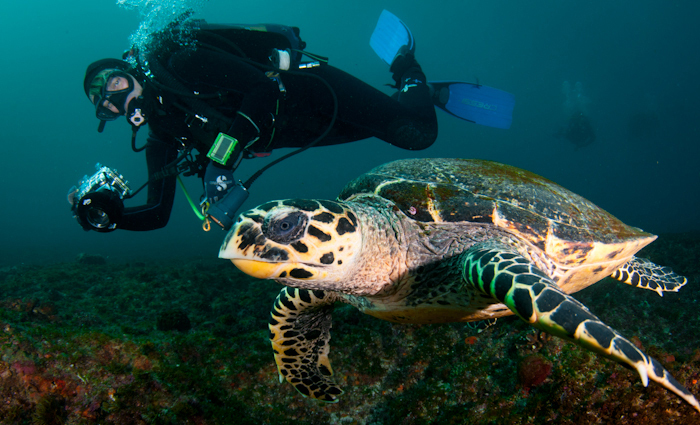 Mozambique – Offers many dive destinations from Ponta de Ouro (Point of Gold), Ponta Malongane and the Inhaca Archipelago in the south, to Inhambane/Tofu, Guinjata Bay and Vilanculos/Bazaruto Archipelago further north. Most are reef-based with dive sites close to the mainland. Vilanculos however has less than spectacular diving near the mainland, the best diving is located out in the Archipelago off Bazaruto and Benguerra Islands. Consequently this tends to be an expensive destination as accommodation on the islands is largely high level. The area is known for its Manitees if you’re lucky enough to see one. Mauritius – Can be an exclusive destination or as a stop over en-route to or from Southern Africa. Diving is again reef-based. The south of the island offers dive sites but the north around Troux au Biches has the better diving. This area is noted for its giant Moray Eels and somewhat pushy Titan Triggers. From Mauritius divers can travel to Reunion Island, a tiny speck to the east but a minimum 5-day stay is required. Zanzibar & Pemba – the “Spice Islands” of Zanzibar are located off the coast of Tanzania, further north than most of our dive destinations. The main island offers many reef-based dive sites including the popular Mnemba Atoll, which can be visited as a day trip or staying on the island, very exclusive, very expensive. Accommodation ranges from back packers to 5-star. Pemba Island is a further 1-hr plane ride from Zanibar and has only a few options for accommodation, but still perfectly comfortable with good food and dive crews. Madagascar – One of the less well known dive destinations, Madagascar offers some good diving with a multitude of accommodation options. All are located at the north of the island, largely off the island of Nosy be. Madagascar is a fascinating island which varies greatly from north to south. We are able to arrange land-based excursion coupled with diving allowing the traveller to experience the variety Madagascar has to offer.